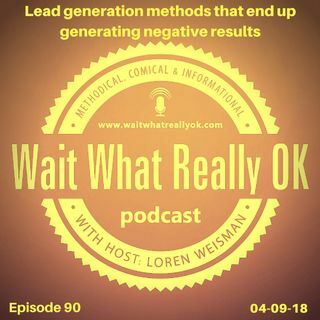 Wait What Really OK Podcast Episode 90 hosted by Branding Strategist talks about the lead generation methods that are full of hype, hoopla and hustle that tend to result in little to no conversion whatsoever. There are way too many motivational coaches that claim they can lead you to the best sales, marketing and education when it comes down to their lead generation methods. The only problem is their how to sell methods are ... See More that they might not apply to you and in many cases can make you come off like you are spamming. It is more than your presentation skills or applying google adsense and Google adwords. It can not just be about the sell to make money online. All these hype coaching videos are claiming to give you the best success and show you how to get sales with cheesy sales videos that will result in tons of business leads. The part they leave out though? What about what you are selling? What about the consideration of other people that are selling too? What about how to engage to showcase your authority, highlight your authenticity and amplify your message to draw people in. Only pushing the pressure sell and the over spamming message that many lead generation methods to you to do will often times leave you with nothing but annoying and getting blocked by a number of leads.